Heat a large skillet over high heat and toast chiles in batches, until browned in spots but not burned, 30 to 45 seconds per side. Toast garlic cloves in their skins in the same skillet, tossing, until browned in spots, about 3 minutes. Peel garlic cloves and place in blender. Add the soaked chiles along with the soaking liquid. Add 1 tablespoon salt, 1 teaspoon pepper, and honey. Purée until smooth (you can run the mix through a strainer if you’d like). In a large Dutch oven or pot over medium-high heat, melt 2 tablespoons vegetable oil. Add 1/3 of the beef, salt and pepper and lightly brown the meat, 6 to 8 minutes per batch. Transfer to a bowl, reserve, and repeat with remaining 2 batches of beef, and seasoning with salt and pepper. Lower the heat to medium and add 1 more tablespoon of oil. Cook the onion with a big pinch of salt until soft, stirring, about 5 minutes. Add cumin and cook, stirring, 1 minute more. Add the chile purée and bring to a simmer. Cook, stirring occasionally, until the purée has lost its raw flavor, about 15 minutes. Add 4 cups broth, oregano, and cornstarch mixture, stir. Add the beef and 2 cups of water. Bring to a boil, reduce to a simmer, and cook on very low heat uncovered, until meat is tender and broth is thickened, about 3 hours. Add sugar and vinegar 1 tablespoon at a time, along with salt, and pepper to taste. 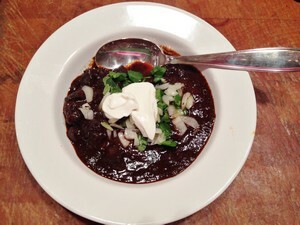 Allow the chili to sit at least an hour and up to overnight to allow the flavors to meld. Serve with lime wedges, sour cream, onion, and/or cilantro. My verdict: Incredibly hot (and we like spicy food)! The original recipe called for chiles de àrbol and cayenne but I never used them (or the jalapeno garnish) and it was still unbelievably hot. I also cut down on the guajillios (because I ran out of them). To combat the heat, I added some cider vinegar to the chile mix when I was blending it and used all the brown sugar and vinegar at the end. I also added about 1/4 of unsweetened chocolate for fun. The meat was tender and delicious and the texture of the sauce was silky and smooth. I cooked it the day before which was a good idea because it takes a while (although it’s easy enough to make) and it gave the sauce a chance to meld. I’m not really sure how you could get this to a significantly less spicy state, especially as the heat scale of chiles is so variable. 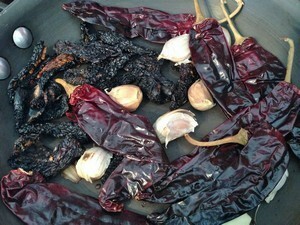 The jalapeños I used to make the chipotles this past summer were very hot–yours might not pack such a punch. Maybe if you tasted a small bit of each of the chiles after they were toasted and softened, and then went easy on the hot ones, you could control it better. Using water instead of the soaking liquid to puree them would also help. Next post: Amazing 4-Hour Baguettes!